Introducing the SLXtreme for the iPhone 7/7s! 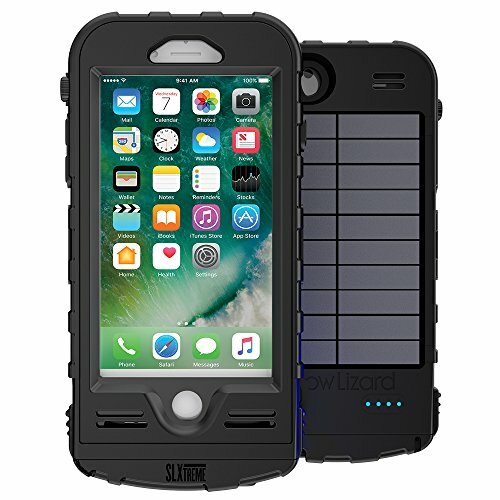 Featuring ruggedized waterproof protection & even more built-in battery-boosting power with an integrated 4000 mAh battery to extend your iPhone’s charge by more than 150%. It also includes a built in solar panel for emergency charge when you're away from a power source. Solar powered - trickle charges case battery to keep you powered. Ultra efficient solar cells, over 20%. the solar power indicator lets you adjust the case so it gets the most charge from the sun. Waterproof - full submersion to 6.6ft/ 2M for 1 hr. Sealed from snow, ice, dirt & dust - exceeds IP-68 Ingress protection rating. Don't be afraid to use your phone in the water with the Slxtreme8. Integrated battery - 4000Mah for over 185% more power. Add 16 hrs Talk time or 12 hours of the essential app you are using in the outdoors. Never be stuck without power. Rugged - built to MIL Spec 810G Certification. The rubberized grips protect against drops and bumps up to 6.6ft/ 2M. Built in screen protector helps prevent scratches to your phone screen. Easily insert/remove phone - the bottom entry allows for easy access to your phone, without ever degrading the performance of the case. The SLX7 case comes packed in a reusable watertight dry box. If you have any questions about this product by Snow Lizard Products, contact us by completing and submitting the form below. If you are looking for a specif part number, please include it with your message.